This very special painting “Flowers is Paradise” shows a combination of flowers so magnificent I was mesmerized by their beauty. With a stroke of luck, I was up in Ocala Florida to visit a client and on my way home I stopped off at a Jumping Competition. Awestruck by the horses, the riders and the magnificence of the grounds I watched the competition. At the end of the course, the last fence, was a triple high pristine white jumping fence decorated at the side posts with the most opulent gorgeous flowers. They were so incredible I never wanted to forget them. That day gave me those incredible flowers that I never wanted to forget so I painted “Flowers in Paradise”. The way these flowers are portrayed are reminiscent of the Venetian painters who used a dark background to highlight magnificent flowers. I decided that a Dark Royal Blue would be a modern rendition yet keeping with the black backgrounds of the old-world Venetian style. “Flowers in Paradise is a beautiful composition of Nature’s loveliness as framed wall art. 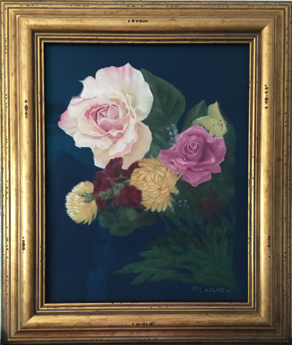 I am thrilled to be able to again re-create and paint this beautiful floral realism again as a unique one of a kind work of art. This Archival Digital Re-creations is heavily layered with the same pastels as the original combined with the Antique Gold slightly distressed frame. The museum glass gives you the true view of the art.